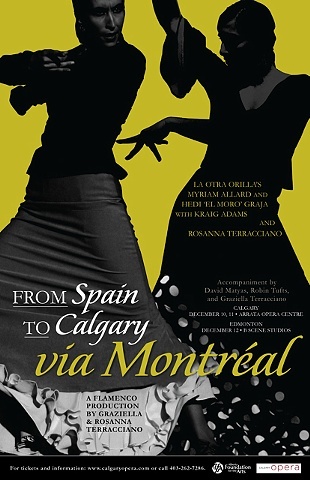 One of Canadas most exciting and innovative new flamenco companies, Montréals La Otra Orilla, comprised of dancer Myriam Allard, and singer Hedi El Moro Graja, along with long-time collaborator, guitarist Kraig Adams will take to the stage in Alberta to present a repertoire of traditional flamenco work. Joining them will be dancer Rosanna Terracciano, guitarist David Matyas, percussionist Robin Tufts and Graziella Terracciano on palmas. We gratefully acknowledge the support of the Alberta Foundation for the Arts and the Calgary Opera.